40 points in 15 minutes and a TD Bryant catch for the ages. 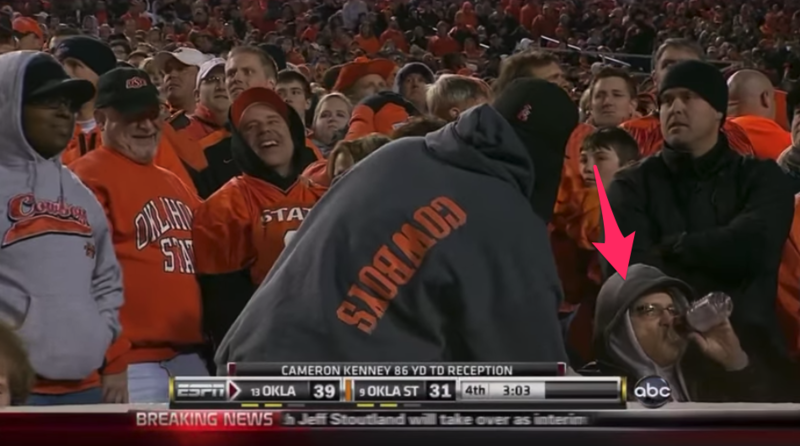 Like any self-respecting Oklahoma State fan growing up, I remember where I was for all of Oklahoma State’s important Bedlam moments. Unfortunately for me (and you), this is not a long list of memories, but it is a notable one. True story: I first wanted to title this mini series Bedlam Confessionals, but I wasn’t sure everyone could handle my missives about how 2004 Bedlam was one of the biggest thrills I’ve ever had as a college football fan or about how, yeah, I kinda like Baker Mayfield. So we’re doing Bedlam memories instead. My history with Bedlam begins (but doesn’t end) with the 1995 game in which the Pokes took down the Sooners 12-0 in Norman for their first win in nearly 20 years. As a 10-year-old, I experienced OSU’s first win since my dad graduated college. The only thing I remember about this game is listening to it on the radio with my dad. We lived in Houston at the time, and apparently we either didn’t have cable or the Big 8 (!) forgot to sign its multi-year, multi-billion dollar deal with ESPN. I didn’t really appreciate what I was listening to or what was happening because I lacked all of the context (all of it), but looking back, that was a pretty big deal, and it represented one of OSU’s two Bedlam wins from 1967-1996. Again, these are not all of my memories, just a sampling of them leading into this week’s Bedlam. No. 2 was in 2001, and I missed it (or most of it). I was a sophomore in high school, and I guess my dad didn’t want to subject my innocent slate of a mind to the horrors of what was going to happen that day in Norman. So we went to my high school’s playoff game at the Astrodome. I don’t remember if they won or not, but I do remember getting home, flipping on the TV and nearly passing out as we watched the final five minutes of Bedlam. Everybody remembers the Rashaun catch — and rightfully so — but the play I’ll always remember is TD Bryant over the middle on third down (he also had a nice punt return — remember those? — to get the drive kick-started). Legend. I definitely freaked out more when Justin Gilbert returned this kick to answer OU making it 40-31 than when Tyreek scored in 2014. My seats at that game were at the perfect angle to see the same holes (from the other side) that Gilbert was seeing. This is what happens when you play elite true freshmen in big boy games. This return came moments after Cameron Kenney went 86 yards, and this amazing screenshot emerged from the highlights. The poor dude in the bottom right has seen some stuff in his days. 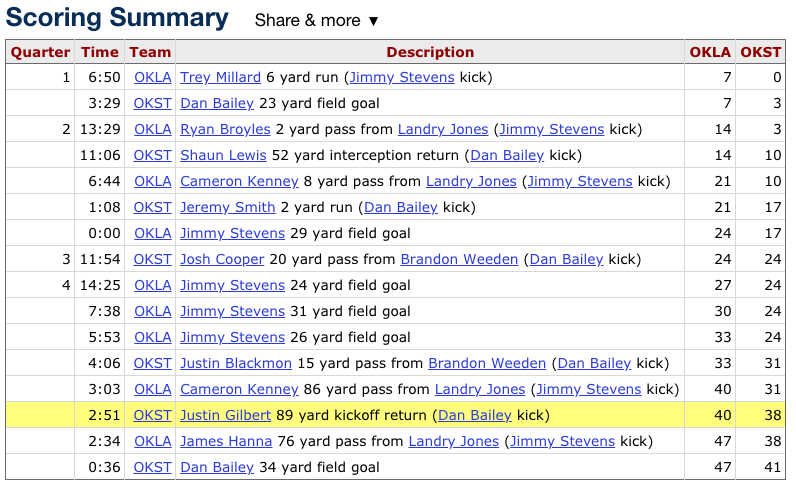 Unfortunately all of it was erased just a few minutes later when Landry Jones found James Hanna to put the game away. 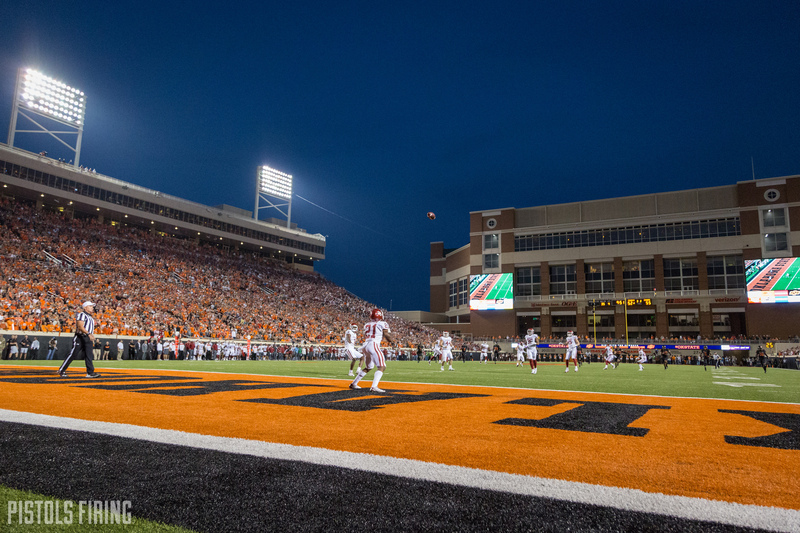 The fourth quarter that night was as good as Bedlam gets — 40 points in 15 minutes. The exorcism of all the demons. The 10,000-pound weight lifted off of and out of Boone Pickens Stadium. The giant gorilla on Mike Gundy’s back removed (don’t worry, it would return shortly). The 2011 game was less a game than it was a celebration. A celebration of the end of nearly a decade of futility. A celebration of OSU’s historic season. 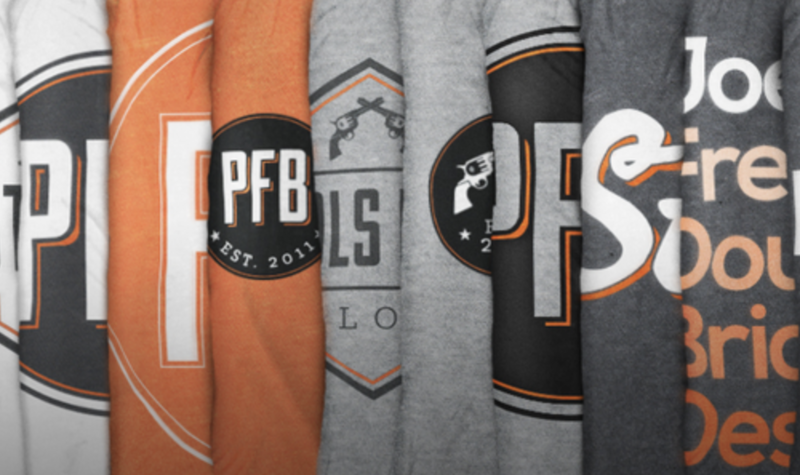 A celebration of the culmination of what Mike, Mike and Boone had started several years earlier. The game wasn’t in much doubt from halftime on (although you couldn’t have convinced anyone in that stadium who had lived through the past 50 years! ), which was the perfect way for that season to end. That OSU team was the best in school history, and it got the blowout it deserved after the 12-game performance the Pokes had just put together. I was in the stands that night. I stood for most of the game at the top of the stadium, taking it all in. I saw a few friends, but I was mostly by myself. This little website was 11 months old, and I had to run out of the stadium as the goal posts fell to post some videos of the goal posts falling. That was probably the end of a specific kind of relationship I had with OSU and OSU sports, but the next one — which I did not fully comprehend at the time — would be maybe even more thrilling and exciting. I remember sitting at a friend’s house that night writing and thinking and talking about how finally (FINALLY!) OSU had defeated OU in a game that mattered. OSU had won itself a conference championship. I don’t remember much of it. I remember getting out my TI-83 to see if OSU had enough hanging chads to get into the title game. I remember when it was announced that they would in fact finish third in the polls. I remember Gundy dancing and Boone in the locker room, and that the end of a wild night in Stillwater, OK I remember taking a big sigh of relief.